Form MVU-30 or the "Affidavit In Support Of A Claim For Exemption From Sales Or Use Tax For A Motor Vehicle Transferred By Repossession" is a form issued by the Massachusetts Department of Revenue. 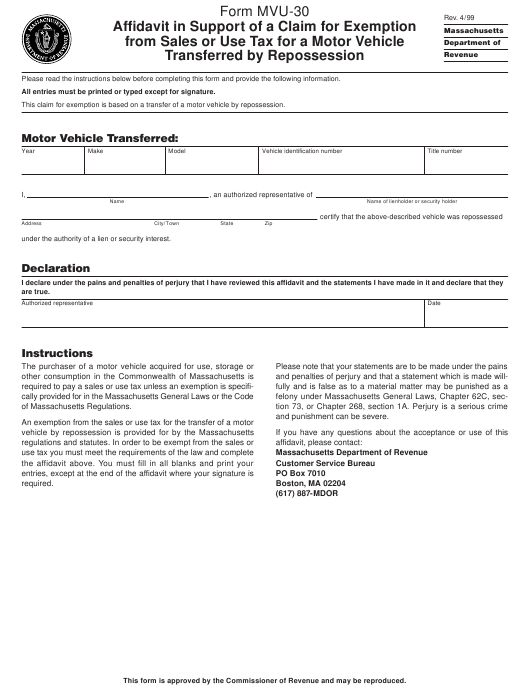 Download a PDF version of the Form MVU-30 down below or find it on the Massachusetts Department of Revenue Forms website. Please read the instructions below before completing this form and provide the following information. All entries must be printed or typed except for signature. This claim for exemption is based on a transfer of a motor vehicle by repossession. under the authority of a lien or security interest. and punishment can be severe. This form is approved by the Commissioner of Revenue and may be reproduced.